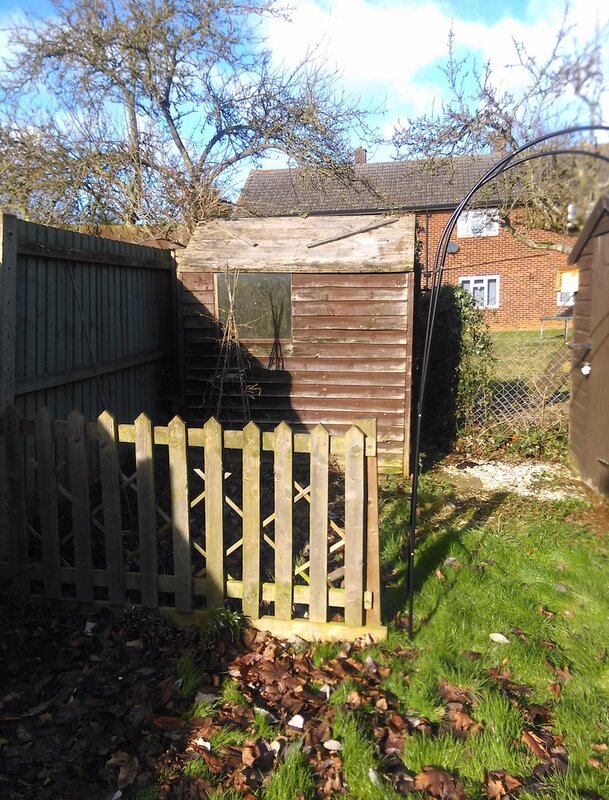 A few weeks ago I got round to dismantling the rickety little old spare shed in the corner of my garden. This has opened my garden up somewhat – not just to more gardening space, but also to the view of the neighbours who back up to my garden. The shed was full of rot, woodworm and ivy. I’ve decided to get some screening from my local garden centre – either Willow or Bamboo should do the job – giving me and both of them – some privacy in their gardens. They both have dogs, and I have a RubyCat, so this should also ease any tension there. I had a rummage through the wood of the deconstructed shed and have pulled out some pretty solid planks, and have turned them into a couple of raised beds. I also took the door and a few other planks and turned them into shelving in the shed. The old shed has been recycled into 2 raised beds. I then put the rest of the shed into the boot of my car and took it to the timber section of my local recycling centre. I’d already decided what’s going in the raised beds, and planted the first plants a few weeks ago. First up were 5 Raspberry ‘Glen Ample’ bare-root plants that I bought from Bunkers Hill Garden Shop (via eBay), and after adding some freshly dug soil and a 125 litre bag of compost, I watered them in. These raspberries should grow upwards, and become established here, so a raised bed at the bottom of the garden should be the perfect spot for them.. even if I’m fairly sure the blackbirds will get most of them! Thankfully, at least some of the raspberries appear to be coming alive. 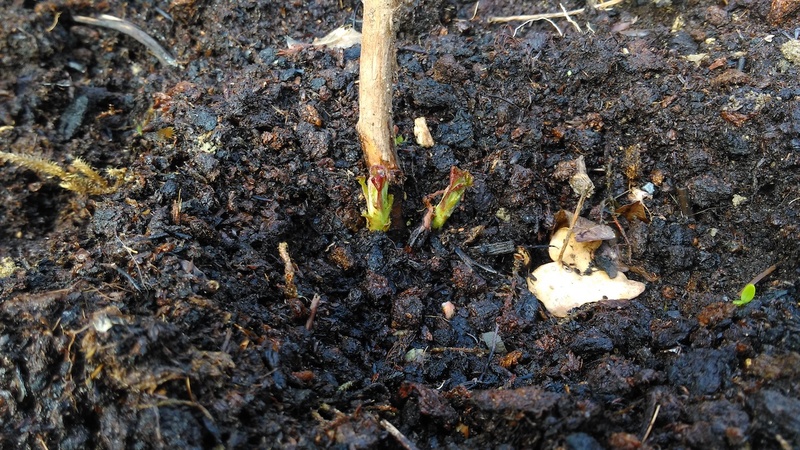 New shoots from the bare-root Raspberry ‘Glen Ample’ canes. 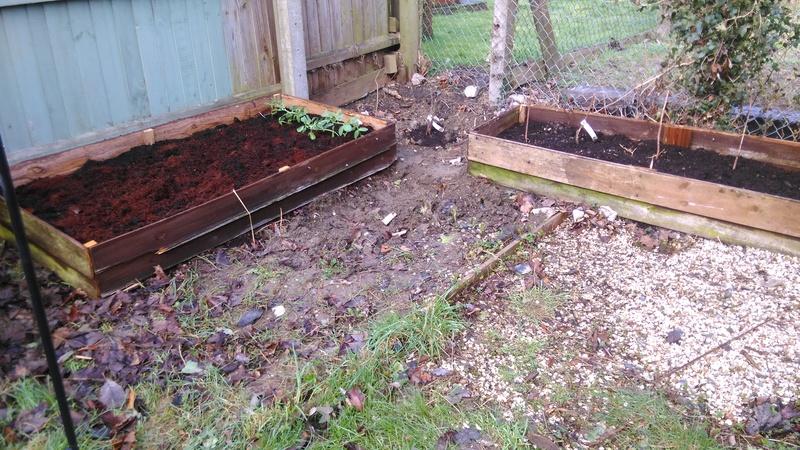 Next to those, but not in the raised bed, is my new Redcurrant ‘Rovada’ bush. Apparently this copes with partial shade, which is good because this is now planted in the corner of the garden where the sunshine reaches for a few hours a day. It’s budding up, but the leaves are yet to break out. When the old shed stood here, I had success with Lettuce, and growing French Beans ‘Blue Lake’ up canes in this area. I shall be doing this again, and have now planted out my Broad Bean ‘Crimson Flowered’ plants, which I have been hardening off in the shed this last couple of weeks. 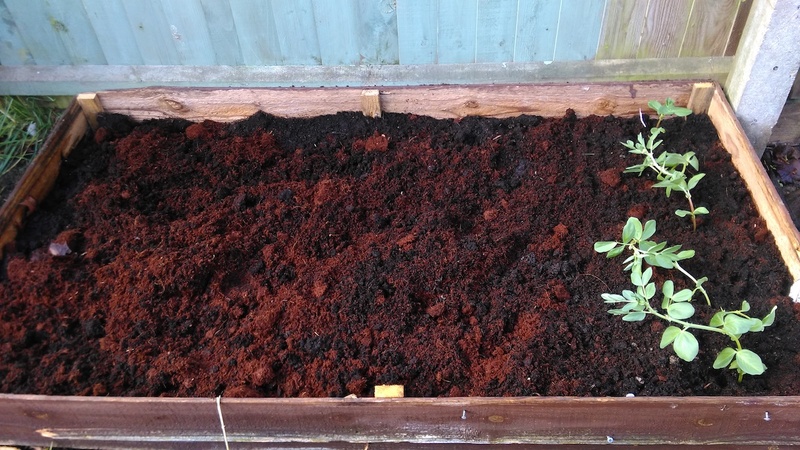 The raised bed contains a mixture of rotting leaves, multipurpose compost, coir compost, and some smelly compost from a council green garden waste centre. The Broad Bean ‘Crimson Flowered’ plants are the first in the raised bed. A couple of days ago I sowed the Lettuce ‘Red Salad Bowl’ seeds indoors, so I should have quite a few of these germinate. I’m growing this variety because I’m pretty sure they were the variety in a mixed leaf pack that the slugs and snails left alone. Fingers crossed! The garden is really sticky at the moment – the weeks of snow, drizzle, and rain, has left everywhere (including my trainers) a bit squelchy. With a bit more sunshine it should start to make gardening a little easier. I have plenty of pricking out and more seed sowing to do in the next few days. What are you up to in the garden? Let me know in the comments below. As always, thanks for reading, and happy gardening!